This week, we are taking our preparedness one step closer towards long-term preparedness and will begin concentrating our efforts on those needed items to sustain us for longer-term emergencies. When emergencies last longer than originally intended, your basic needs such as food and water become the highest priority. Food and water security is one of the greatest advantages for being prepared for longer-term emergencies. In order to understand the importance of having a long-term food supply, you need to begin seeing food as a necessary investment to your family’s well being. When I first began storing a long-term food supply 3 years ago, the price of food was still relatively cheap for most of the foods I bought. Because of that investment that I made, I am still living off the food that I bought 3 years ago and have saved a lot of money as a result of the increased food prices. It is best to store dry goods for long-term storage. Dry foods that we typically see in our pantry such as grains, rice, beans, oats, wheat, corn kernels, powdered milk, sugar, salt, baking powder, etc. are the best types of foods to store. Also, having an understanding of how long certain foods last can help you in your food supply endeavors. This guideline can help you determine how long your stored foods will last. Usually, foods that are purchased at a grocery store are packaged for short-term use. Therefore, if these foods will become part of your long-term food supply, they will need to be re-packaged. Since there are many techniques used for re-packaging food, I will discuss the techniques that I use in my own preparedness supplies. Feel free to do some research on your own to learn different ways to storing food. Multi-barrier system – Many preppers like to choose a multi-barrier approach to store their food. This barrier system will keep natural elements such as sunlight, moisture and air out of the container when sealed. The multi-barrier method uses Mylar bags (also called food liners) to initially seal the dry food and then the Mylar bags are placed in a food grade plastic container. There are different sizes of Mylar bags that can be used. I have small Mylar bags to use for my short-term food sources and large Mylar bags that fit into 5-gallon plastic containers to use for my longer-term food sources. Vacuum sealing method – I use this method for short-term food storage by vacuum sealing dry food in food sealer plastic packaging and then I add the sealed plastic packages to Mylar bags. Then, I seal the Mylar bag. This is a little more work, but when I go to grab the food, I know that I have taken every precaution at ensuring it’s quality. Mylar bags technique – Some people only use Mylar bags to store their foodstuffs. I use this approach in my short-term food supply because the food is usually in smaller quantities and will be used more frequently. However, there is some risk to using this method because it can leave the food supply vulnerable to natural elements and also to insects. To learn more about sealing food appropriately, click here. In order to have these foods stored properly, you need to right tools. The tools that I have suggested below are used for short and long-term food storage preparation. These necessary investments will ensure that your food sources are protected from your food’s worst enemies. Food Storage Containers – Any large quantities of food that you plan to store indefinitely should be stored in food grade containers. These containers will not transfer any non-food chemicals into the food, nor are there any chemicals within the container that are hazardous to humans. Typically a food grade container has a #2 by the recycle symbol or the acronym ”HDPE” stamp on the bottom (HPDE stands for “high density polyethylene”). Before any food is to be stored, clean the containers with soapy water, rinse and dry thoroughly. 5-gallon plastic containers are the most popular amongst those who store bulk quantities of food. Also, ensure that you have an air tight lid. Mylar Food Liners – Research has shown that over time, slow amounts of oxygen seep through the walls of plastic containers. Consequently, over time natural elements, and even insects can find a way inside the container. To add additional protection, adding a food liner, such as Mylar bags will ensure that there are multiple barriers for the food to be protected in. These food liners come in an assortment of sizes. Food Sealers – Food vacuum sealers remove and lock out air and moisture using specially-designed bags and canisters. This ensures that the longevity of the foods are preserved for as long as possible. Using food sealers are a great way to ensure that all oxygen is removed from food sources before it is placed in a long-term environment. Oxygen Absorbers – Using oxygen absorbers greatly prolongs the shelf life of stored food. Because it absorbs the oxygen from the container, it inhibits the growth of aerobic pathogens and molds. Oxygen absorbers begin working the moment they are exposed to oxygen. Therefore, it is best to work as efficiently as possible. Oxygen absorbers come in different sizes, so pay attention to the size needed for the container. Typically, 2,000 cc’s of oxygen absorbers should be added to one 5-gallon bucket. Oxygen absorbers are not edible, not toxic and does not effect the smell and taste of the product. Desiccant Packets – Desiccant packets moderate the moisture level when placed in a food container. They do not absorb the moisture. Please note that desiccant is not edible. If the packet somehow breaks open and spills onto the stored food, the entire contents of the container must be thrown away. There are certain food items that desiccant should not be added to, specifically: flour, sugar and salt. These items need a certain amount of moisture to stay activated, and if desiccant is added to it, they will turn into a hard brick. Heat Clamp – A person can use a heat clamp to seal the Mylar bags, or they can seal their Mylar bags with a simple at home iron put on the highest setting. The heat clamp is usually around $85 and is specially made for sealing Mylar bags. If the home iron method is used, ensure that you use a hard surface such as a cutting board or book to iron on and slowly go over the Mylar bag. Note: if using an at home iron to seal Mylar, this method must be done gently and slowly or the Mylar will be damaged. Call around to different restaurants around your area and see if they have any food grade containers with lids that you can have. Typically, restaurants are happy to give these away as they have no need for these containers after they are used. This could save you a lot of money investing in food grade containers. Storing food is a continual process of using, rotating and resupplying. If a person invests in a food supply, the food should be used and more food purchased to resupply the storage shelf. Think of your food supply as a small store where the foods in the front has the shortest expiration date and the ones in the back have the longest. 1. Find a safe, dry area in the home to store your longer-term food supplies. Those who are tight on space can use creative methods such as shelving units high in their closets, extra bedrooms or closets. As long as the space is dry, is free from temperature fluctuations, and is large enough to store the foods, it can be used. It is best not to use a garage or attic as a food storage area due to the drastic temperature fluctuations that occur in these areas of the home. 2. 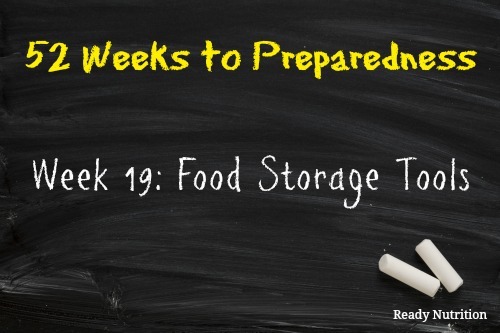 Make a list of what types of long-term foods you plan on storing for your long-term food supply. Those that have family members with special dietary needs should do further research on which types of foods they will need. 3. Practice using your food storage tools on short-term foods to ensure that you understand how to tools work. My comment is I have been getting more free 2-5 gallon food grade containers & lids from our local grocery stores’ bakeries than I do from any of the restaurants in the DFW area. Some of the lids even have the rubber rings still in them. I bring them home and clean them up from the icings that were in them, bleach them and let them dry out in the sun. My question is “Do I need to seal up these containers that I am using to break down 50 # bags of rice, sugar, beans, salt , etc with tape, hot glue or parafin wax, etc or are they fine just using the original lid”? You should be just find with using the original lid, however, if you feel comfortable with taking extra precautions, then I’m not going to dismiss that need. If sealed probably, the lids will prevent the elements from effecting the contents inside. You can also use mylar bags to seal the food in along with using a storage container. You can read more about that storage method in this article. YES! Remember the icing aroma will still linger IN the plastic. This will be a beacon for mice and other rodents. They can and HAVE chewed through the buckets. I found this out the hard way! 15# of oat groats GONE! DOUBLE seal I have not had any issues w/critters since I seal inside a mylar bag. I also cut bag in half for 2 buckets. Hubby works at a grocery store and they are now trying to sell them for $2 each. Buckets are also good for chicken nests (on side) and fishing gear, wet shoes AND the trip to the local country club stable for manure! !